Straddling the top of the world, one foot in China and the other in Nepal, I cleared the ice from my oxygen mask, hunched a shoulder against the wind, and stared absently down at the vastness of Tibet. Today’s Post a Day Challenge – start a post with the first line of your favorite book – is a perfect example of me living vicariously. Isn’t that one of the qualities of a really good book? Family and friends know that I am not a cold weather person and have never been to China, Nepal or Tibet. What they may not know is this is the first line of one of my favorite books: Into Thin Air by Jon Krakauer. It is an account of a multi-team climb on Mt. Everest that included a crew filming for an IMAX production. I knew the ill-fated outcome of the climb before I read the first word. That made no difference. I was captivated from the start and could hardly tear the book from my hands when the plane landed. I’m sure I was up reading into the wee hours of the morning. The first time I read the book, I was flying to Chicago to spend a couple of days with my college roommate. As the pilot announced the cruising altitude of 30,000 feet, I remember looking out the window and imagining I could see the crest of Mt. 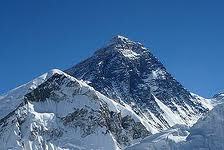 Everest, about 1000 feet down. I had one of those hair-up-on-the-back-of-your-neck shivers. When the IMAX production came to Discovery Place in Charlotte, NC, my husband and I went to see it. What I had read in the book collided with the incredible footage on the screen. Awe and agony; I knew what was coming but couldn’t force myself to look away. I have no desire to climb Mt. Everest, but I was fascinated with the process one goes through to prepare for and climb it. I read and re-read the sections on what happens internally when our bodies are in that kind of altitude and under that type of stress. I felt the anxiety of the family members waiting at home. I felt anger with the stupidity/narcissism of some climbers that endangered the lives of others. I felt like I was there. It was a great book and definitely worth a look if you haven’t read it.